A “yes” on Prop. 305 would keep SB1431, (the “vouchers on steroids” bill), in place as approved by the Legislature in 2017. That means modifying the statute in the future would be incredibly difficult, and that is where the problem lies for the school-choice crowd. Indeed, the prospect of locking that law in place has been enough to give even the staunchest supporters of Empower Scholarship Accounts pause. “If Prop. 305 passes, it could hinder our ability to make crucial improvements to the ESA program,” said Kim Martinez, a spokeswoman for the pro-voucher American Federation for Children. Here’s a curious and rather enlightening development. The “dark money” groups that spent big bucks to get a Legislature willing to vote for a massive expansion of Arizona’s school-voucher program are not going to campaign to try to save their crowning achievement. The Republic’s Rob O’Dell and Yvonne Wingett Sanchez are reporting that the Koch-funded Americans for Prosperity will sit out Proposition 305. Meanwhile, the Betsy DeVos-created American Federation for Children actually will urge people to vote no. A yes vote on Prop. 305 would act as an endorsement of Gov. 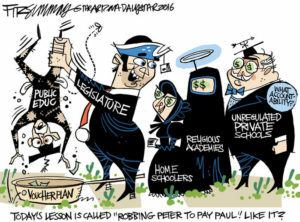 Doug Ducey’s and the Legislature’s voucher expansion program, while a no vote would serve as a citizen-initiated veto. Voucher supporters are worried that if Prop. 305 passes, the student cap on vouchers – the one added at the last minute in order to win Sen. Bob Worsley’s vote – would become voter-protected and thus virtually impossible to lift. That is, the cap that he, the crucial 16th vote, was assured would remain in place. Worsley in 2017 was the focus of the powers-that-be, who for years had been working to funnel the public’s money into private and parochial schools in the name of school choice. It was Worsley or bust for the special interests out to ensure that private and religious schools get more and more (and yes, more) of the public’s money. And it was Worsley who folded like an accordion, agreeing to support the expanded voucher bill as long as Empowerment Scholarship Accounts (read: vouchers) would be capped at 30,000 students by 2020. Even before Ducey signed the bill, one of its key architects, the Goldwater Institute, was assuring its financial backers that the cap imposed to get Worsley’s vote was meaningless. “We will get it lifted,” Goldwater’s then-CEO Darcy Olsen wrote in an email to supporters, an hour or so after the bill passed. “She was negotiating in bad faith with us if that was her intention,” he said at the time. If? It’s always been the intention of Republicans and their dark-money sponsors to impose an unlimited universal voucher system. 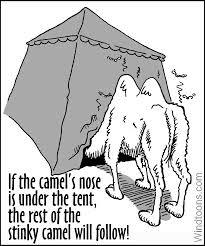 First came camel’s nose (only disabled kids to get ESAs), then his front legs (foster kids added to ESA program), then the first hump (kids in failing districts), then the second hump (kids on reservations) and now, the third hump (all kids, but limited to 30,000 students). The inevitable next step? The camel’s big hairy, you-know-what. But a funny thing happened on the way to playing Worsley and the public. A group of ordinary citizens launched a successful referendum, freezing the new law and putting it on the November ballot as Prop. 305. Now, we learn that not even the most ardent supporters of the expanded voucher program want it to pass. Private schools for the suburban haves whose parents can afford to supplement a voucher in order to afford private school tuition. And woefully underfunded public schools for the largely poor and minority have-nots who can’t. You think our leaders’ commitment to public schools will grow stronger once all the well-to-do kids are gone? Expect the pro-voucher forces to try again next year or the year after. But for now, they’re letting their achievement go for fear that the cap on students – the one put there to get the program passed — would become impossible to remove. “If we look at it 10 years down the road, if we have something that is voter protected and capped, that’s just not going to be something that’s advantageous for all 1 million-plus students in the system,” AFP’s Andrew Clark told the reporters. The surest way to ensure that the “privatize public education for profit” crowd does not get a do-over of legislation for “vouchers on steroids” in the next legislature is to elect a Democratic legislature and governor. As a person that worked to get 305 on the ballot because believed in stopping bad legislation as well as a person in a minor party, it sounds disingenuous to say the voters must elect a Democratic legislature instead of a democratic legislature. There are people in all the different parties that do not believe in the 305 voucher system. What people need to do is to find out which candidates have walked the walk and are going to vote NO on 305 because they believe that is the right thing to do. Vote the person not the Party.